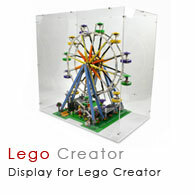 We have designed and developed this range of acrylic display cases specifically to fit Lego sets. Ideal for keeping those Lego sets dust free and protected from sticky fingers. You can choose to buy the clear acrylic display case on its own or with a base. 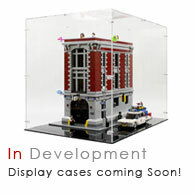 We are developing new cases to fit more Lego sets on an ongoing basis. These cases may fit other Lego sets. View the product details for internal dimensions. 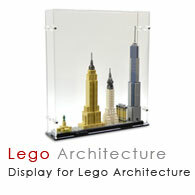 Checkout the Frequently Asked Questions about our Lego Display Cases. Browse these categories under "Display Cases for Collectibles"
Featured products under "Display Cases for Collectibles"
Pure Display brings you a sizeable range of lasting acrylic collectible storage units. Our display cases for collectibles are the perfect solution to keep precious items protected from damage or dirt. Built to last for years and offering complete protection, our products can give you the certainty you are looking for. With attractive design and efficient functionality, we ensure the best products for our clients. 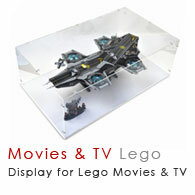 You can display anything from Lego sets to precious items with our acrylic cases. 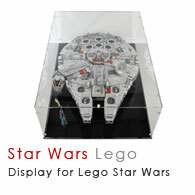 We offer Full Size Lightsaber Display Cases, Black Widow 1/6 Scale Figure Display Cases, Display Cases for 12 Nintendo Amiibo Figures, Display Cases For Lego 21103 DeLorean Time Machine, Display Cases For Lego 21108 Ghostbusters Ecto-1 and many more products. 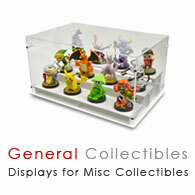 We maintain a large stock of display cases for collectibles to meet your constant demands. You can place your order any day and at any time, and you will always find the products you need. In case you want the products the day after you place the order, you can try out our next day delivery service. We promise to send the goods in perfect condition to your stated address. Do you want to know in detail about our display cases for collectibles? In that case, drop us an email and we will be happy to answer your queries. You can also give us a call to speak to one of our shopfitting experts and discuss your needs. Do not forget to subscribe to our newsletter to receive discount vouchers.